Calcutta, also known as Kolkata, in West Bengal in India. 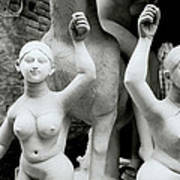 One of the most fascinating places in Kolkata is the potters district known as Kumartuli. I spent a morning in these alleys meeting the potters and photographing the Hindu deities. 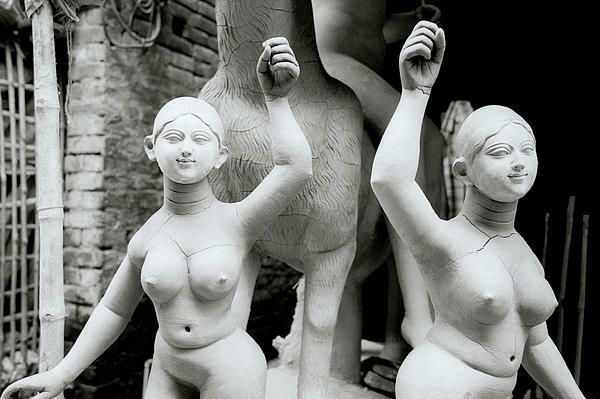 The skill of the potters is incredible, to create these beautiful sculptures out of clay mud. This one is of dancing Goddesses. I loved the surreal beauty in this representation and the ultimate iconoclasm where the deities are sacrificed in the Hooghly. 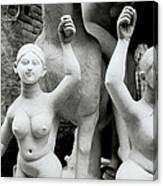 Hindu Goddesses in Kumartuli, or Kumortoli, the potters' district in Calcutta (Kolkata) in West Bengal in India. 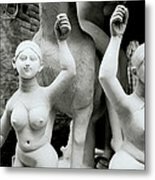 Kumartuli is the potters' quarter in north Calcutta. This community of potters provides beautiful clay sculptures (of many different sizes) of the Hindu pantheon of deities for Pujas in Calcutta.